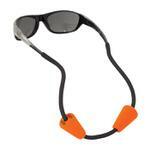 Never lose your eyewear on the water again with the high visibility, easy-to-spot Buoy Buddy. This floating eyewear retainer floats 1.1 oz. sunglasses.